In the spring I was lucky enough to get a growing plot as part of the ‘Model Market Garden’ in the corner of Marble Hill Park in Twickenham, created as part of the Jam Yesterday, Jam Tomorrow project. I also volunteered in the spring to help build the raised beds, lay the turf, and planted potatoes. 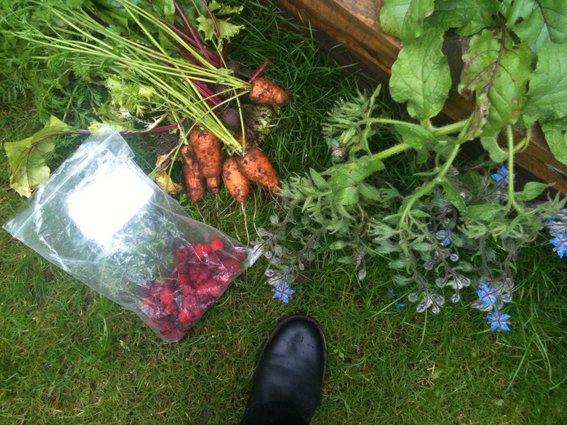 It’s the first time since my early 20s at growing things to eat. My parents had an amazing vegetable garden through my entire youth so I know what it’s like to eat a lettuce pulled up with roots and mud and the striking taste of things lifted straight from the soil. I’ve been growing edibles more off than on since then mainly due to shady gardens; the negotiation between seedlings and slugs too much. And for the last five years, nothing except a pot full of rocket and herbs. 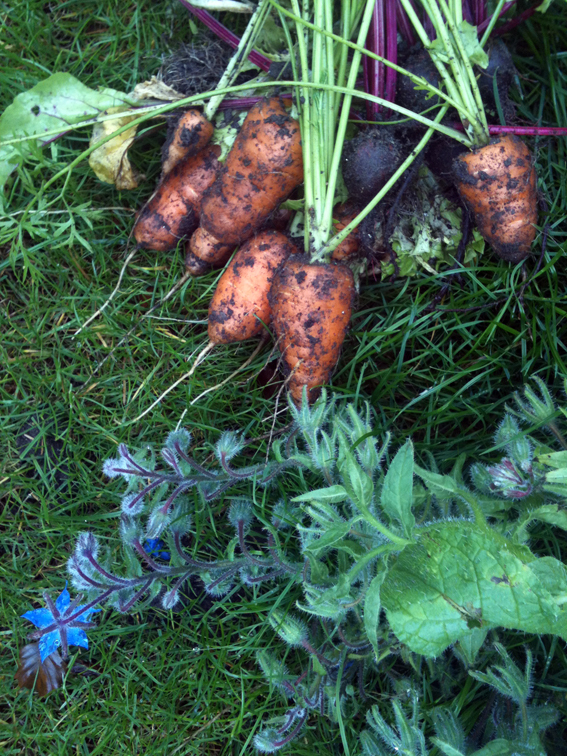 So the plot has been a timely reintroduction to the elevating experience of growing things to eat. It’s not that big – maybe 7 by 2 and a half feet – something like that. I thought it would be too small, but I’ve grown so many things in it. And I can say it’s been an excellent part of my summer. I love going there at dusk of an evening on my bike – no one else is about and the quiet in amongst the growing things is very peaceful, stilling. And visiting a garden at a short distance away is interesting: the moving towards something you’re tending, caring for, then the time spent there, and then leaving it; thinking about it from a distance. Over the summer, I’ve had an ongoing supply of tasty Webbs Lettuce, dill, mustard leaves, rocket, beetroot leaves. 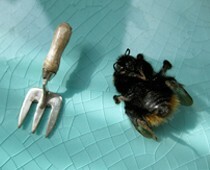 I also planted things for the pollinators – borage, brilliant hairy borage. And cornflowers for the blue. It’s been raining much of August. And I have been away for a week. Yesterday I went to see what I could find. 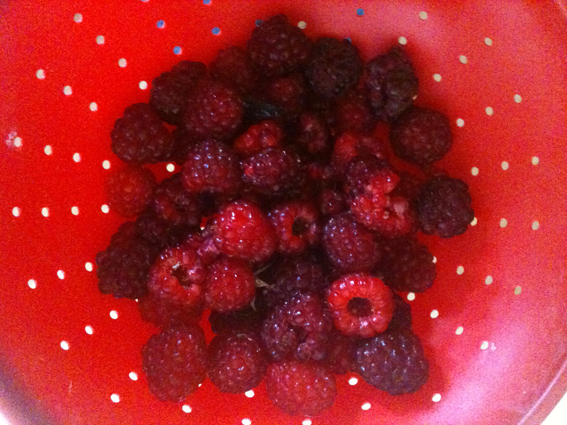 A full bowl of garnet coloured ‘Autumn Bliss’ raspberries for tea. 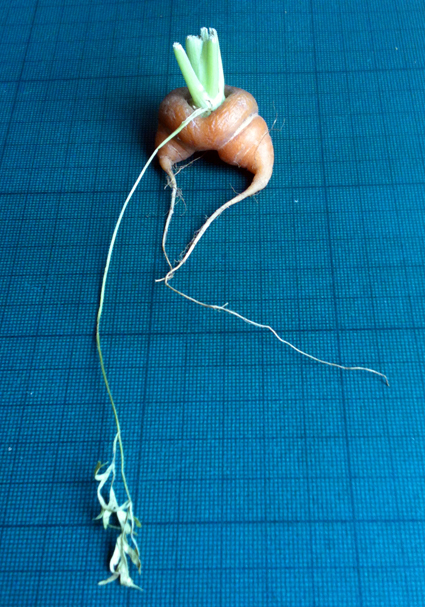 The first ‘Early Scarlett’ carrots (planted late in the spring). Small beetroots. Borage flowers for the salad. A guest for supper. A third of the dinner home grown. The pleasure is cellular. I find ‘thinning’ quite complicated – the slight discomfort at the necessary task of pulling up some in order to make space for others to grow to their fullness. I recognise the need, yet want all the plants to succeed. So I hesitate, leave too many to push against each other. The result is good though. 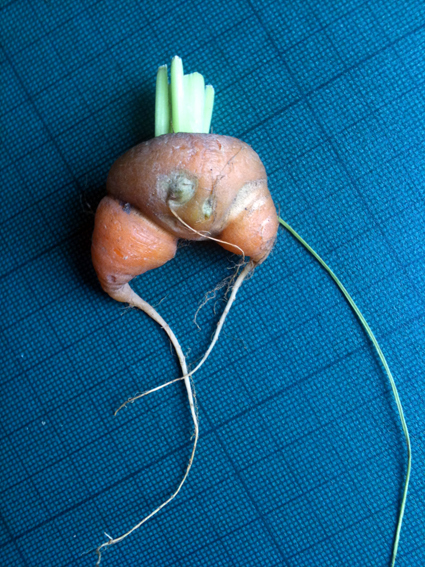 This is my favourite carrot harvested. And it’s got a bottom hole.